My name is (YOUR NAME) and I am from (YOUR CITY OR TOWN). I am one of the thousands of residents who support expanding access to licenses for undocumented New York residents. This will make our roads safer, it will allow people to follow the same process as everyone else and keep families together. The bill number is S01747 / A03675. This bill is important to me because (REASON YOU SUPPORT LICENSES). Our community can not wait any longer, I urge you to sign on as a co-sponsor and take action to pass A03675/S01747 as soon as possible. Can we count on you to support expanded access to driver’s licenses? Thank you! We look forward to working together with you to get S01747 / A03675 passed! The Green Light Coalition will be in Albany March 12th and we hope to count on your support. What additional information do you need about the bill to address your concerns? Is there someone in your office our campaign can follow up with? Please share a picture or video on social media and tag your rep and leadership! Here are the graphics to share. Mi nombre es (SU NOMBRE) y soy de (SU CIUDAD O PUEBLO). Soy uno de los miles de residentes que apoyan expandir el acceso a licencias de conducir para incluir a los indocumentados. Esta ley hará más seguras nuestras calles, permitirá que las todas las personas sigan el mismo proceso que los demás y se mantendrán unidas las familias. El número de la propuesta de ley es S01747 / A03675. Esta propuesta me importa porque (RAZON POR LA CUAL USTED APOYA LICENCIAS). Nuestra comunidad ya no puede esperar, le imploro que se anote como patrocinador y tomar acción para pasar la legislación A03675/S01747 lo más pronto posible. ¿Podemos contar con usted para apoyar expansión de acceso a las licencias de conducir? ¡Gracias! Esperamos con mucha anticipación trabajar juntos con usted para aprobar a S01747 / A03675. 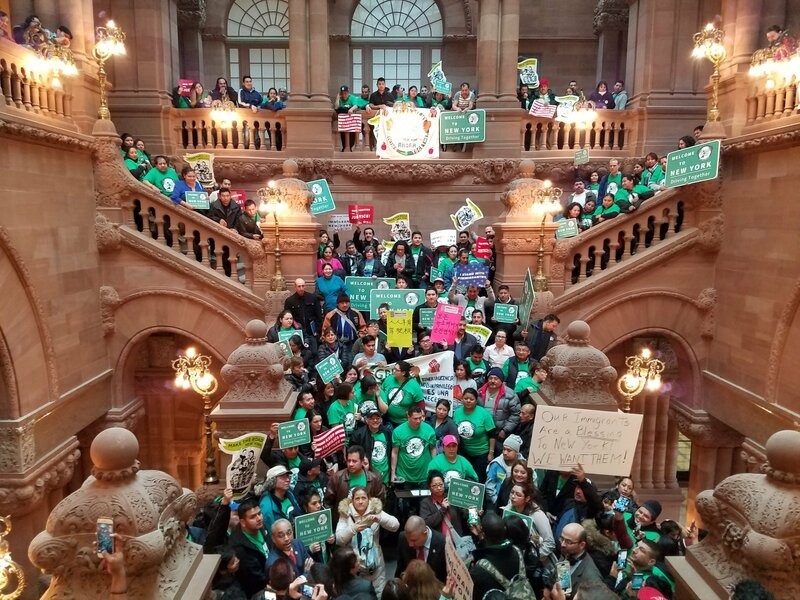 La Coalición de luz verde va a estar en Albany el 12 de Marzo y esperamos contar con su apoyo. ¿Qué información adicional necesita sobre el proyecto de ley para resolver sus inquietudes? ¿Hay alguien en particular en su oficina con quién nuestra campaña puede dar seguimiento? Por favor comparte una foto o video en las redes sociales y etiqueta a su representante y el liderazgo, aquí está nuestra fotos para compartir en las redes sociales. As a follow up to the news that a prominent farmworker organizer was detained we are now able to make public that it was Carlos Cardona, the Alianza Agrícola co-founder and co-president and a dairy worker in our area for over 10 years. On the evening of Thursday, August 30th, Carlos was pulled over by Attica police and turned over to Border Patrol for not having a valid driver’s license. He is now being held at the Buffalo Federal Detention Center in Batavia, NY, facing deportation and separation from his three-year-old daughter and wife. Carlos is a prominent organizer with Alianza Agricola and part of the statewide campaign Green Light Driving Together, an effort to expand access to driver’s licenses for all New Yorkers, regardless of immigration status. He is originally from Guatemala and has been living in the United States with family for a decade. The day Carlos was detained, August 30th, was also his daughter’s 3rd birthday. Rather than joy and celebration, the family was torn apart, her father criminalized for nothing other than coming to the U.S. to work hard and provide for his family. Ironically, that same day was the NYS Fair’s themed “Dairy Day” and Carlos’ boss was in Syracuse with dairy farmers from across the state celebrating the industry. The irony doesn’t stop there. Today is Labor Day, and members from the Alianza Agricola and thousands of other undocumented immigrant workers are in the milk parlors and in the fields working long shifts in the extreme heat and without any overtime or vacation pay as if it were just any regular day. In an interview with Carlos from detention last night, he reminds us, “we’re not complaining about that. We just want to be able to get a license to be able to drive if we need to go to the doctor or so that we can buy fresh healthy food each week.” Carlos isn’t a criminal. His only “crime” was to come to the U.S. to work hard and help provide for his family. There are two ways you can help: 1) support them through the nightmare they are experiencing and donate funds for the legal and other expenses this will incur for his family, and 2) demand executive action from Governor Cuomo to expand licenses to all immediately and stop the deportation pipeline that is separating NY’s immigrant families simply because they don’t have an NYS ID. Please donate to this GoFundMe Page that has been set up to support his wife and child: http://bit.ly/familysupportneeded. In addition to financial support for his family, we are expecting that if Carlos is able to be released on bond it will be set at the exorbitant price of $10,000. Any donations that you can give are very much appreciated – as well as sharing with your family/friends/networks. And thank you to all who have already donated and shared this campaign! Almost $2,500 has been raised by 50 people in just two days!